Do you often dream of living a more rewarding life? Do you aspire to a better job, a stronger relationship or a happier home? Do you want to discover your full potential? Your path to a brighter future begins with these straightforward but powerful guidelines, and ultimately Joel will help you experience victory, joy and satisfaction every day. Now this best-selling title is available in this handy smaller format. 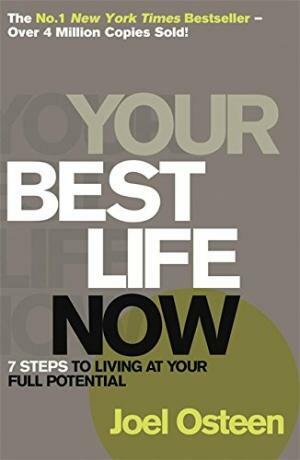 Your Best Life Now by Joel Osteen was published by Hodder & Stoughton in March 2008 and is our 3862nd best seller. The ISBN for Your Best Life Now is 9780340964514. If your life is marked by “low self-esteem, worries, fears, feelings of inadequacy and insecurity”, then this book has been written for you. It comes across rather like a long sermon, full of illustrations from Osteen’s family life, and with, to my taste anyway, rather too many glowing references to Joel’s ‘daddy’, his predecessor as minister of North America' s largest church, Lakewood, in Houston. Osteen urges us to become ‘favour-minded’. God’s ‘favour’ (a word he cherishes, meaning God’s ‘preferential treatment’ towards those who belong to Him) sometimes seems frankly worldly – parking spaces, position in shop queues, and the like. “God wants to increase you in His wisdom and help you to make better decisions. He wants to increase you financially.” Sounds suspiciously like the ‘prosperity gospel’ school of thought, in which Joel Osteen is a leading light. That has alarmed some reviewers! To be fair, Osteen adds that it’s not merely financial increase that you can expect, but “supernatural promotion in every area of your life”. Step Number 6, “Live to Give”, was the one I warmed to. “God created us to be givers not takers. If you miss that truth, you will miss the abundant, overflowing, joy-filled life that God has in store for you.” Good, but there is a danger that giving is a tool to self-fulfilment rather than the expression of selfless Christian love. Even when Osteen stresses the importance of excellence and integrity (Step 7), he can’t resist saying, “integrity and prosperity are flip sides of the same coin”. For all my dissatisfaction with some features of the book, I have to admit it is readable and down to earth. But even if these 7 steps – and they are not particularly original to Osteen - will lead you to “a life filled with an abundance of joy”, the question remains, how do we implement the advice? What if you try to take the steps, but don’t experience the favour of God? Whose fault is that? Got a question? No problem! Just click here to ask us about Your Best Life Now.